Nikko, Japan, nestled in the mountains north of Tokyo, is a small town, but is home to an incomparable assemblage of UNESCO World Heritage Sites. 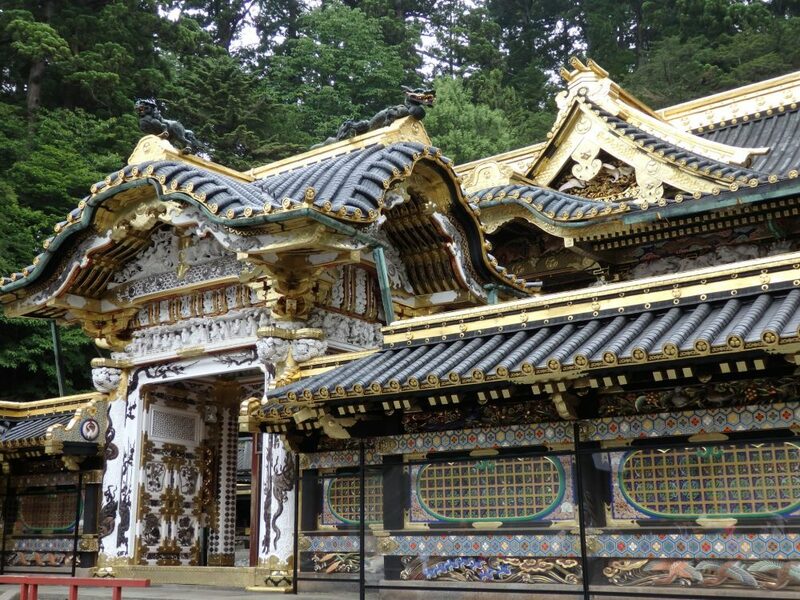 Sprinkled around a national park forest above Nikko town is a collection of Shinto and Buddhist shrines and mausoleums that are breathtaking in their beauty and workmanship. Most of them date to the 17th century. 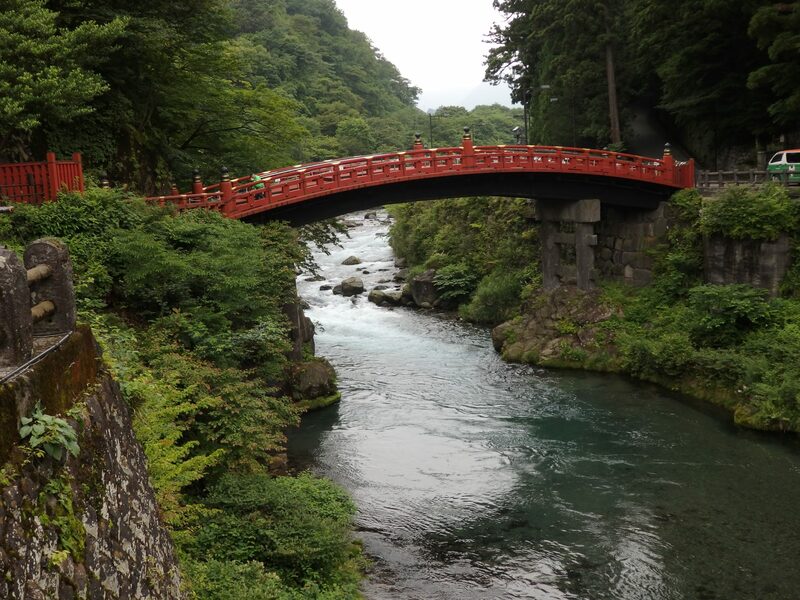 The first hint that you are nearing the shrines is the bright Shinkyo Sacred Bridge. Don’t bother paying to cross it; there’s a modern bridge right next to it. 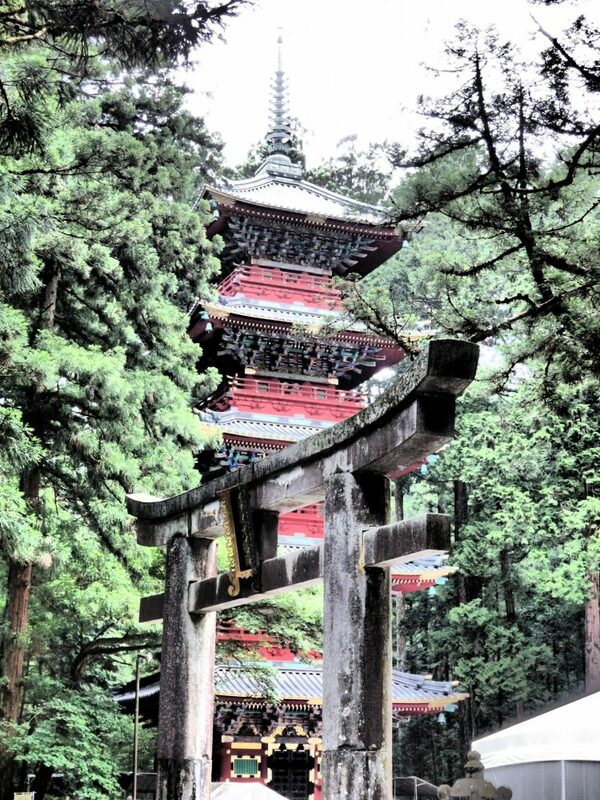 Follow any of the several staircases up into the forest and you’ll come upon shrines, temples and pagodas to explore. There’s plenty more to see besides the bridge as you wander into the forest. 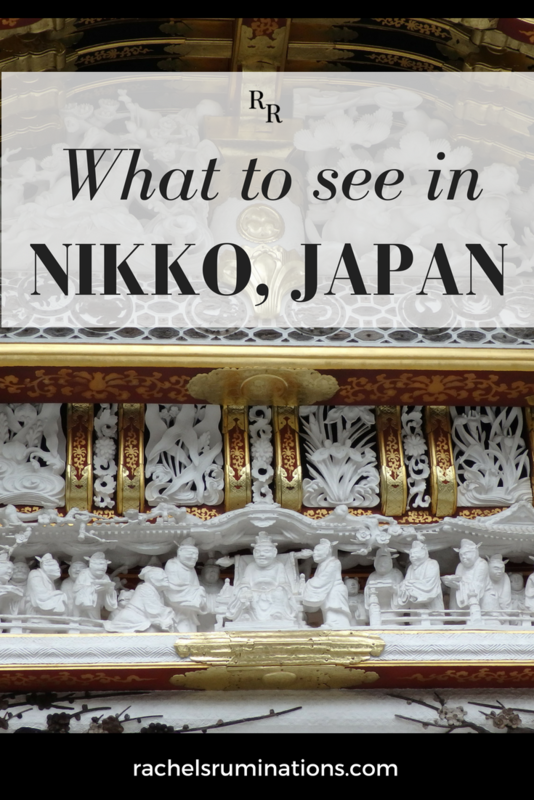 Here are just the few of the main sights in Nikko. As I searched for Rinno-ji Temple, I was horrified to see a large industrial building marring the seemingly untouched forest I’d been wandering through. Drawing nearer, I realized it is Rinno-ji Temple, or, rather, this ugly, utilitarian building encloses the whole temple, in order to allow extensive renovations. 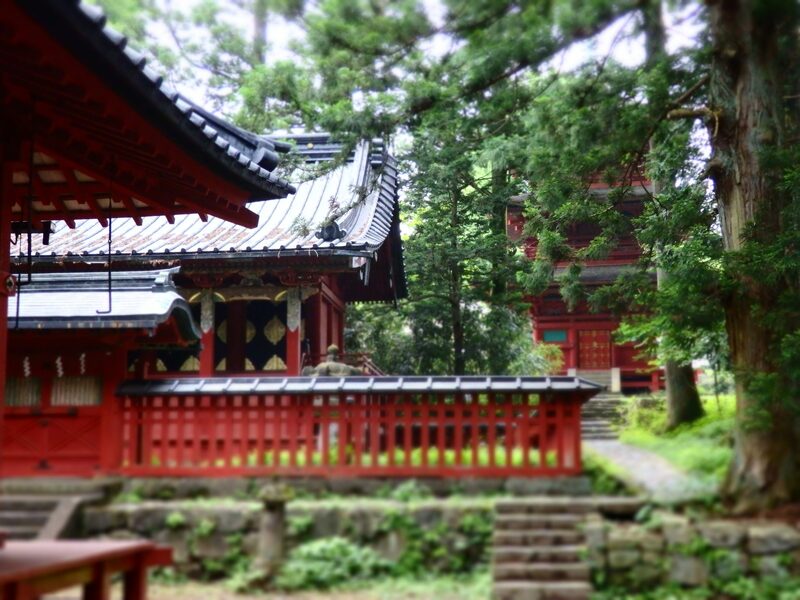 Unfortunately, Rinno-ji Temple will be closed for repairs for several more years. It’s scheduled to reopen in March 2019. However, visitors can climb the stairs inside the building to view the work in progress. Doing so revealed that the temple wasn’t really there anymore. It had been taken apart right to its foundations, and the areas around the sides of the building were piled with the pieces. 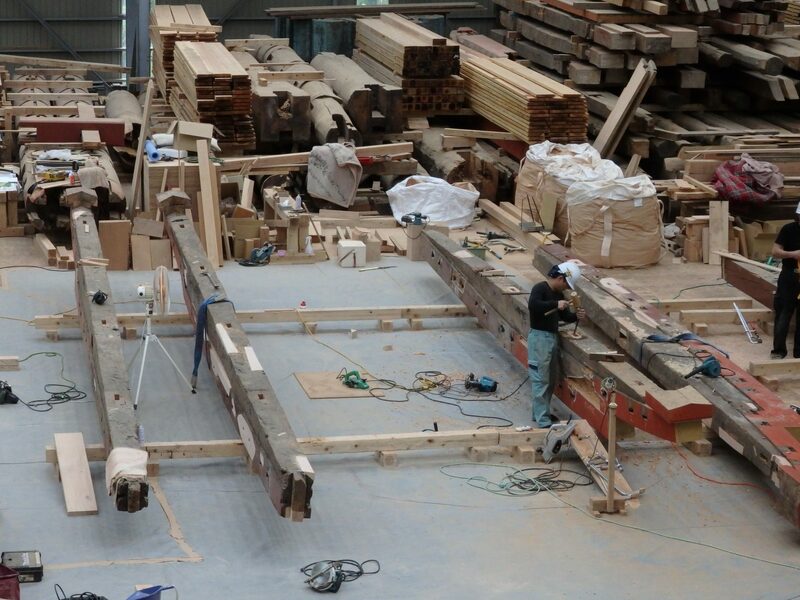 A few workers were busy repairing some beams, presumably saving what they could of the termite-damaged wood and replacing what couldn’t be preserved. Rinno-ji Temple is actually a collection of 38 buildings, mostly built in the mid-17th century. The building I describe above is a “Buddha hall.” As you stroll the paths in the vicinity, you’ll see many of the smaller temples. Near the Rinno-ji Temple is the Five-Story Pagoda (1818), though it’s actually part of the Tosho-gu shrine. Visitors can’t enter, but it makes a wonderful sight, surrounded by ancient trees. Another unmissable stop on the list of what to see in Nikko is just past the pagoda: the Toshu-gu Shrine. The main building is a truly over-the-top confection: multi-colored, unlike most of the shrines, big and small, in the park, most of which are predominantly red. The detailed artwork on every available surface is exceptional. Toshu-gu Shrine is a complex of 42 buildings —warehouses, a stable, a drum tower, a bell tower, and several shrines. Most were built in 1636. When you pay your admission fee you’ll receive a small map, so you won’t miss anything. Take your time here. The three Sacred Warehouses are wonderfully detailed, including carvings of elephants by someone who’d clearly never seen one. 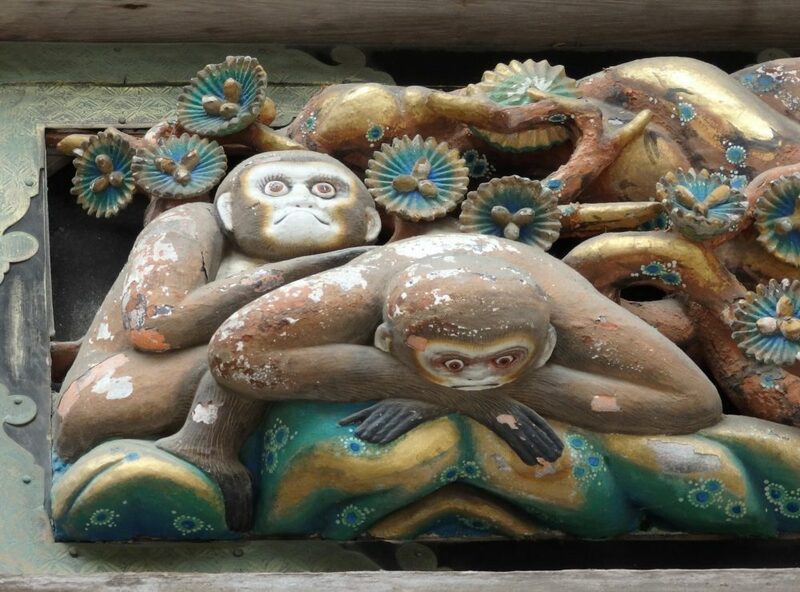 The famous three monkeys carvings on the Shinkyusha nearby are amusing. The classic “Hear no evil, speak no evil, see no evil” image is only one of several that together tell a story, helpfully translated on a signpost nearby. 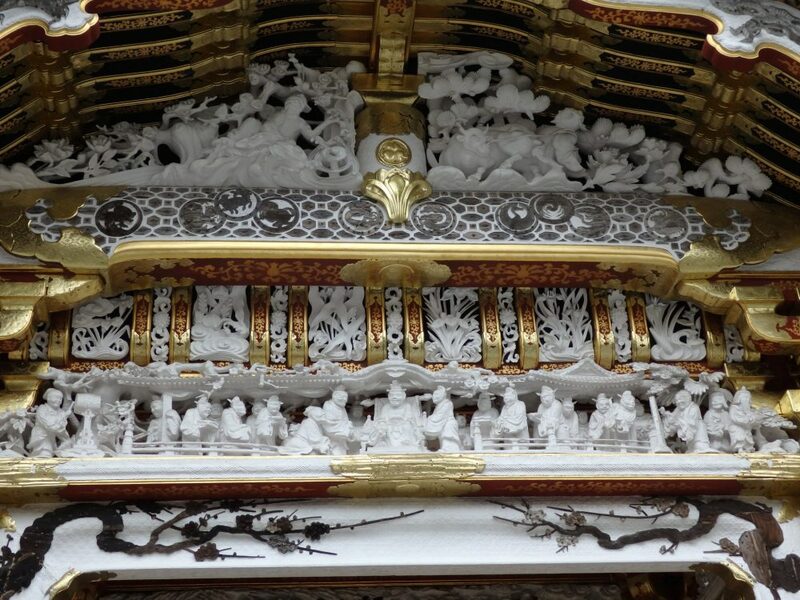 The Yomeimon Gate has breathtaking detail, worth a careful study. Check out the three-dimensional carvings covering every inch. 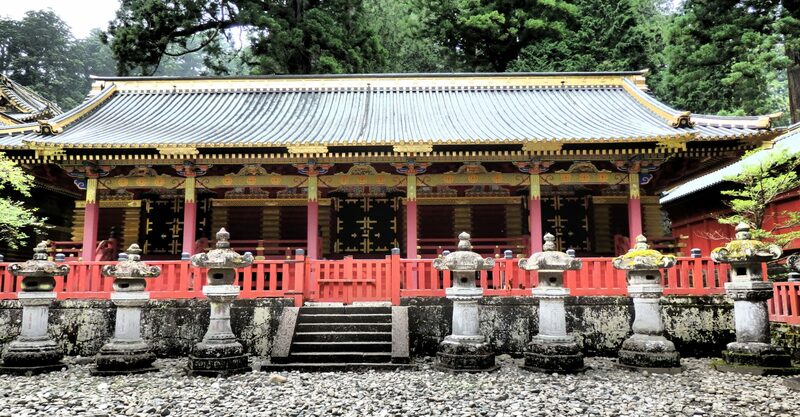 This is just a small sampling of what there is to see scattered in the forest of Nikko. I had planned two nights and one full day to see it, but could have used an extra day. I would have liked to make the hike up to the quieter Takino Shrine and see Shiraito Falls, for example, but felt exhausted from all the walking I did around the more popular sites. Be prepared, if you visit, to walk a lot. You’ll have plenty of company, since many people visit Nikko as a day trip from Tokyo. The temples are ranged up a hill in a forest, and you’ll climb a lot of stairs before the day is done. If you like hiking, the national park around the temples is beautiful, and, though I didn’t stay to visit them, apparently lovely waterfalls, wild monkeys and lush mountainous landscapes are waiting to be explored. Nikko is particularly popular in the fall, when the leaves are changing, so you’re likely to encounter the most crowds then. While there is a direct train between Tokyo and Nikko that will get you there in two hours or less, it is operated by Tobu rather than Japan Rail. If you are traveling on a Japan Rail Pass, you should take the train from Tokyo or Ueno station to Utsunomiya, then transfer to a Nikko-bound train. It still should only take about 2 hours. Read my post about Japan Rail for some advice on how to navigate the train system. It takes about 20 minutes to walk from the train station to the Shinkyo bridge, or take the 5-minute trip on the “World Heritage Meguri” bus to the bridge, but you’ll have to walk into the forest from there. The easier option would be to take a tour from Tokyo to Nikko. The bridge costs ¥300 to cross ($2.60/€2.30), but as I said above, you can get a good look at it for free from the modern bridge right beside it. You can walk the paths in the forest for free, but if you want to enter any of the major temple complexes, you’ll need to pay the entry fees. There is no ticket available that covers them all. Tosho-gu: Open daily April-October 8-17:00, November-March 8-16:00. Admission: ¥1,300 ($12/€10). If you want to enter the Treasure house or the Museum, you’ll have to pay extra. Rinno-ji: Open daily April-October 8-17:00, November-March 8-16:00. Admission: ¥400 ($3.60/€3) for the temple, and another ¥300 ($2.60/€2.30) if you want to see the Treasure house or Shoyoen Garden. 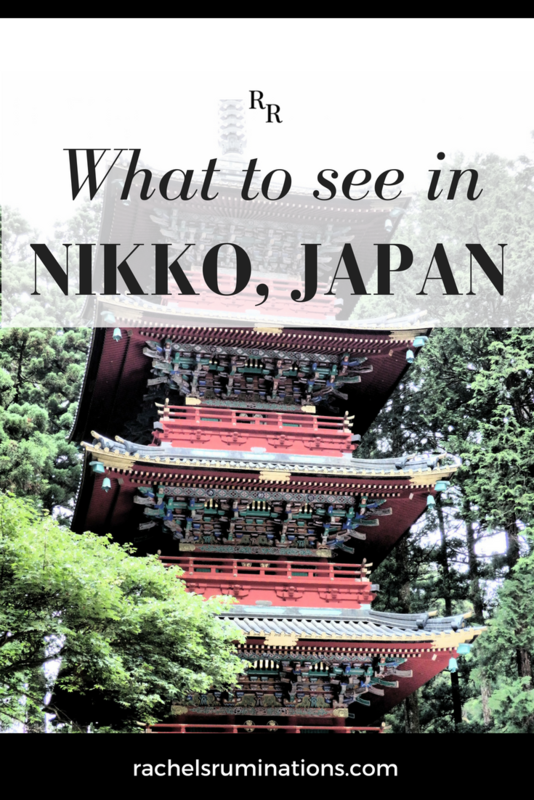 Have you been to Nikko? 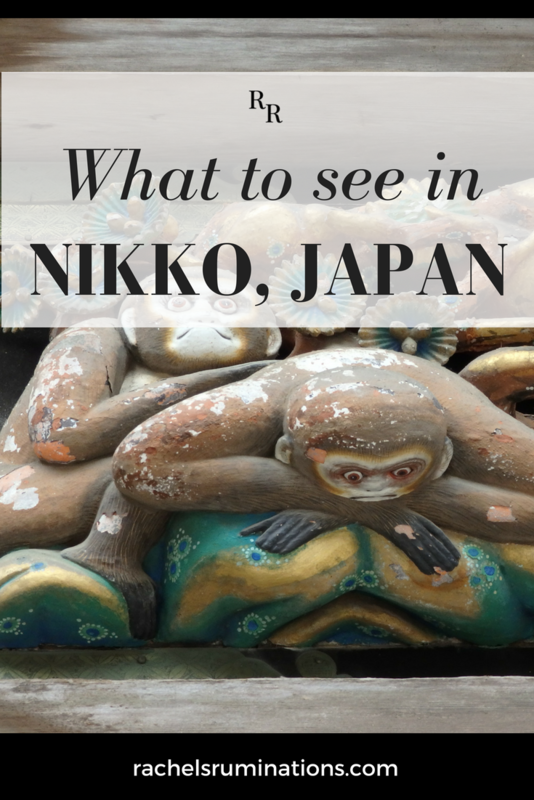 Is there more that you’d add to the list of what to see in Nikko? If you liked reading this article, please share it! The images below are formatted for Pinterest. I am a co-host of the Travel Photo Thursday Linkup. Check out all the amazing travel blogs and photography at the links below! What a group of amazing places. I have heard about Nikko but didn’t know it was surrounded by forest. Like the monkey sculptures. Forested mountains, so it was cooler there than in Tokyo, which made walking more comfortable. It is an amazing collection of sights! Thanks for commenting! Hi, I am a co-host too – welcome. I just love Japan. Our first trip was last year for 2 weeks in Kyoto. I’m thinking of returning next year for cherry blossom season. Nikko looks great. Hi! Nice to “meet” you! If you’re there for cherry blossoms, it sounds like Kanazawa is the place to be. I’ll be posting about Kanazawa soon, though without any cherry blossoms! But Nikko was pretty amazing, and I would recommend it even above Kyoto! Great photos especially the money carvings! 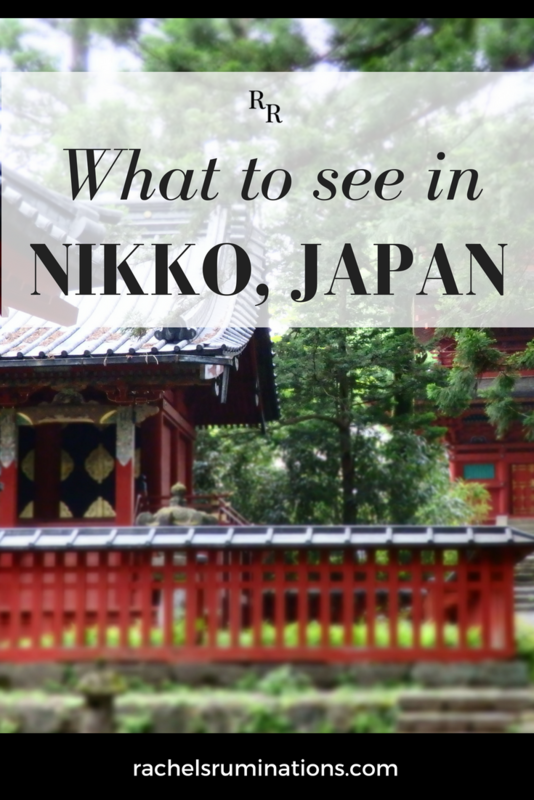 Nikko is a beautiful area and lovely to walk around and explore as your photos show. It is beautiful! A highlight of my trip to Japan! Hi Rachel. Your photos are gorgeous. I haven’t visited Nikko yet, but on my next visit I definitely will. Maybe by then the temple will be rebuilt and open in the public. Thanks, Nancie! I think the temple is reopening in 2019, but I’m not sure exactly. It’s a long process! I enjoyed your photos of the Sacred Bridge and the monkey carvings. Such a major restoration of the temple is probably necessary due to a lack of maintenance. Most historical sites need upkeep lest they fall to ruins. The fact that the restoration is trying to preserve as much original as possible indicates the reverence held for the temple and its ideals. Yes, at least I hope so! It will be beautiful once it is done, and seeing the restoration in progress was interesting. Thanks for commenting!